To Share the Gospel, You Need to Know the Gospel. The gospel can never be a side issue in our lives, for it is the power of God unto salvation (Rom. 1:16–17). If we lose the gospel, we lose everything. What excites me about Ligonier Ministries is its passion for the gospel and for helping people know the gospel. 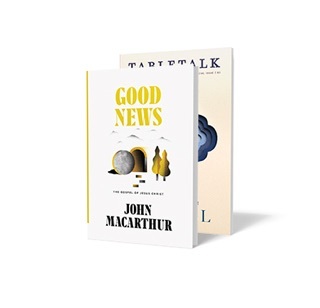 This month, when you give a gift of any amount to Ligonier Ministries, we will send you a copy of John MacArthur’s new book, Good News. We will also include a special edition of Tabletalk magazine focused on the heart of the gospel that we encourage you to read and share with a friend. As Paul tells us in Romans 1:1, the gospel is “the gospel of God.” It is not merely a gospel about God—though it is that—but it is a gospel that belongs to God. The gospel is authored by Him, empowered by Him, blessed by Him, and used by Him to save a people for His own glory. Because it is God’s gospel, it possesses the same qualities as God Himself. It is an authoritative gospel, carrying the very authority of our Creator. It is a powerful gospel, attended by His Holy Spirit to convert all whom He chooses. It is a gracious gospel, born from the mercy of the Lord to undeserving sinners. Sadly, however, we see in our world not only a neglect of the gospel but also a misunderstanding of the gospel. The gospel is often preached as a way to escape a meaningless or lonely life. But while the gospel gives us meaning and helps us overcome loneliness, its primary purpose is not to save us from those conditions. First and foremost, the gospel saves us from the wrath of God. Through Christ, we are saved by God from God for God and unto the glory of God. If we have not proclaimed the person and work of Christ, we have not shared the gospel. Not all of us are called to be full-time ministers of the gospel, but all of us are called to make known the glories of the saving grace of God in His gospel wherever He has called us. By supporting Ligonier with your gifts and prayers, you are supporting gospel teaching through various media, mission partnerships, in-person education, and many other avenues. There are two teachers and preachers who immediately come to mind when it comes to faithful gospel proclamation: R.C. Sproul and John MacArthur. That is why I am pleased that Ligonier has partnered with John to release a new book that is particularly relevant to this topic—Good News. As our thank you for your gift this month, we will send you a copy. In these pages, you will discover the biblical basis for the good news of salvation that is in the person and work of the Son of God, Jesus Christ. We will also include a special edition of Tabletalk magazine that we encourage you to read and share. Thank you for standing with Ligonier in proclaiming the gospel of God. Our good faith estimate of the value of this resource is $13.50. Offer expires 9/30/18. Please allow up to six weeks for delivery after your gift is processed.